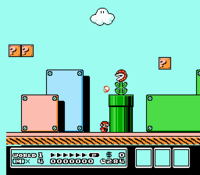 World 1-1 is the first level of Grass Land in Super Mario Bros. 3, and is subsequently the first level in the game. World 1-1 in the NES version. The level is largely plain based and features common enemies like Goombas and Koopa Troopas. This level also introduces the Super Leaf, which transforms Mario into Raccoon Mario. The level begins with a Goomba walking towards the player. Continuing forward reveals a Fire Piranha Plant (a normal Piranha Plant in the GBA remake) lurking inside a pipe, along with more Goombas and Koopas. There are two ? Blocks in this area; one contains a Super Mushroom, and the other contains a Super Leaf. After this is a stretch of flat land, with two Goombas and a Red Paragoomba. The player will then encounter more platforms, some holding Koopa Troopas. They will also come across a stack of Brick Blocks; one of these blocks holds a P-Switch. Finally, they will then eventually reach the goal. In the area of flat ground with the Goombas, the player can get a running start as Raccoon Mario and fly upward; this will take them to a secret area made up of clouds, with a ? Block containing a 1-Up Mushroom. Running and flying further past this area will take the player to a very tall pipe; inside is a bonus room with coins in the shape of a large 3. The pipe leading out of this room will take the player outside, right next to the goal. This page was last edited on April 11, 2019, at 20:08.